A meteor is seen streaking left to right above the constellation Orion in the early hours of Dec. 14, 2012, in the sky above Tyler, Texas. The meteor is part of the Geminid meteor shower, which will have its 2018 peak this Thursday and Friday. The Geminid meteor shower lights up the night sky each December, and this week it will be at its most visible, according to a NASA blog post. 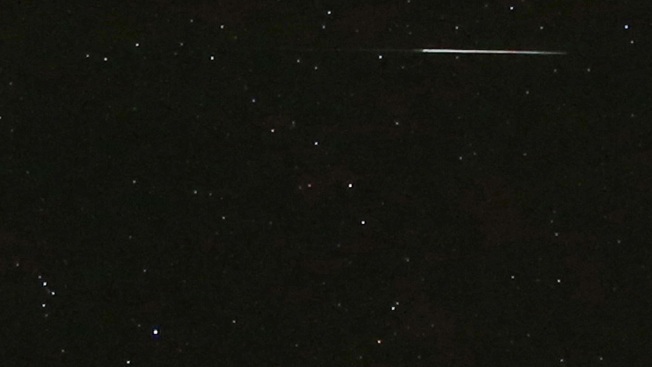 The Geminid meteors become active when Earth passes through a particularly massive trail of rocky space debris. When this debris enters Earth's atmosphere, it burns up and lights up the sky with "shooting stars." The debris comes from a strange rocky object named 3200 Phaethon. To catch a peek of the fiery rocks, you'll have to find the darkest place you can, as many of the fainter meteors will be invisible due to light pollution. Still, NASA predicts that those in suburbs may see 30-40 meteors per hour, with varying changes depending on how close you are to a city. NASA recommends looking for them after 10:30 p.m. local time. The peak of this year's shower is expected on Thursday and Friday, around 2 a.m. local time. You can look out for when the meteors will be visible in your neighborhood at this link.